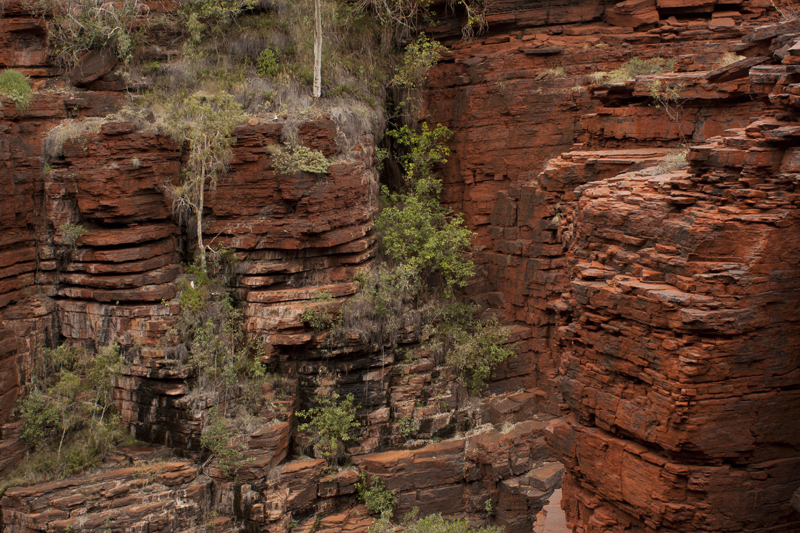 Karijini National Park would have to be the most remote national park we’ve visited thus far, 627,422 hectares of landscape in the semi arid Pilbara region. From one gorge to the next, we spend the good part of one afternoon scrambling down and up rocks and swimming in a cold pool at Joffre Gorge. From Dales campground we take a sealed road to the Joffre lookout car park where we’ll be able to follow a marked trail down into the gorge. 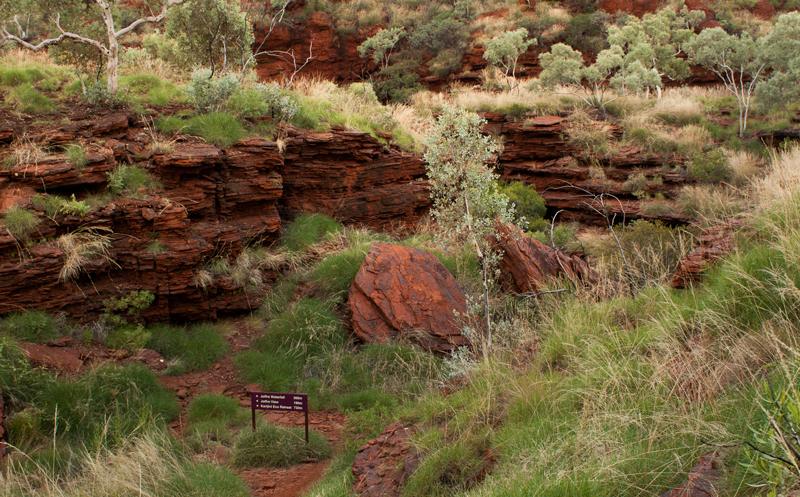 Firstly though, we walk the short trail to the lookout which gives us a wonderful vantage point of the gorge. Thanks to plenty of rainfall over summer, the water is flowing and I’m looking forward to cooling off under the waterfall. 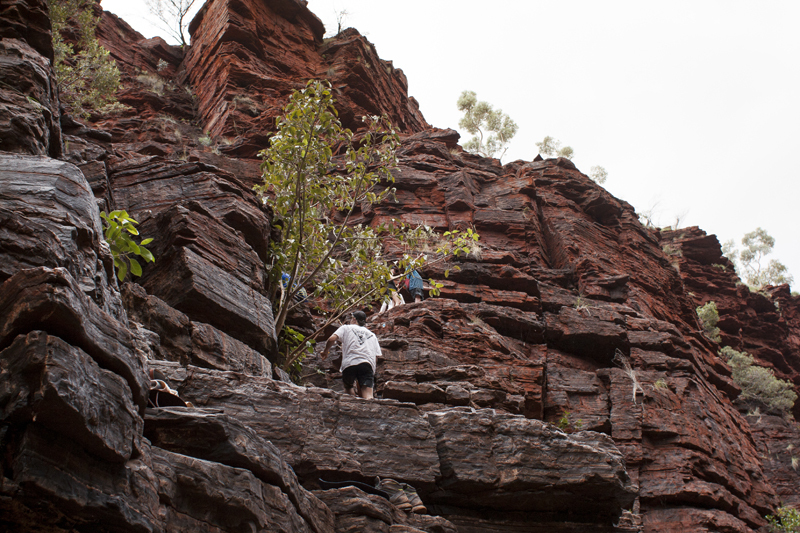 From the look out, an ant line of people provide some indication of the descent into the gorge. We begin. 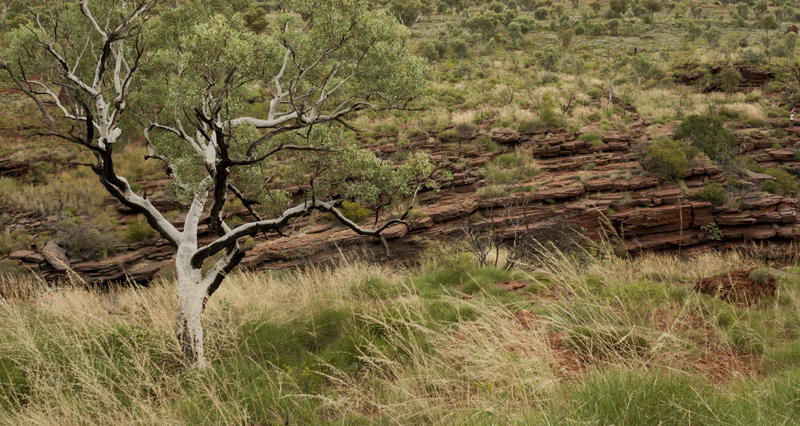 Above the out of sight gorge, an uneven trail takes us amongst arid spinifex grass and gums with strikingly white bark. This particular one has regenerated from a fire and overtime the new white bark will replace the charred black colour. 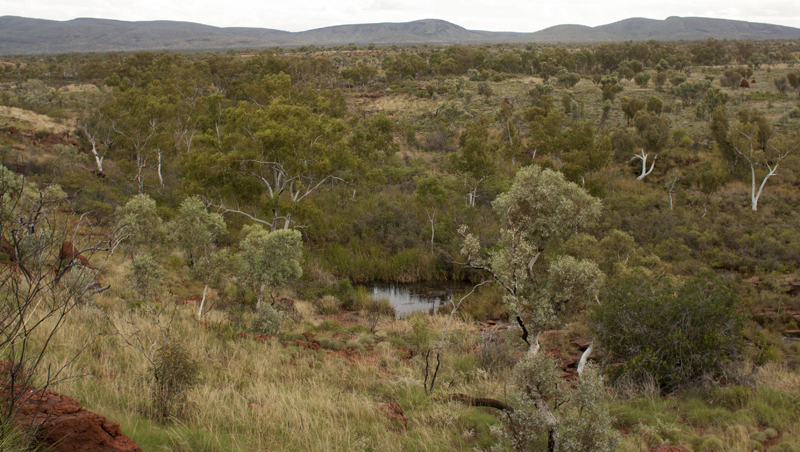 The green expanse is stunning and views don’t seem to end in this wilderness area. Adjacent the gorge is Eco Retreat which offer glamping style tents along with camping bays. Eco Retreat and Dales camp ground are the two options for spending a night in the park. Standing on the trail, what lays ahead is overwhelming for the eyes and I think I fall short of capturing just how epic it all is. 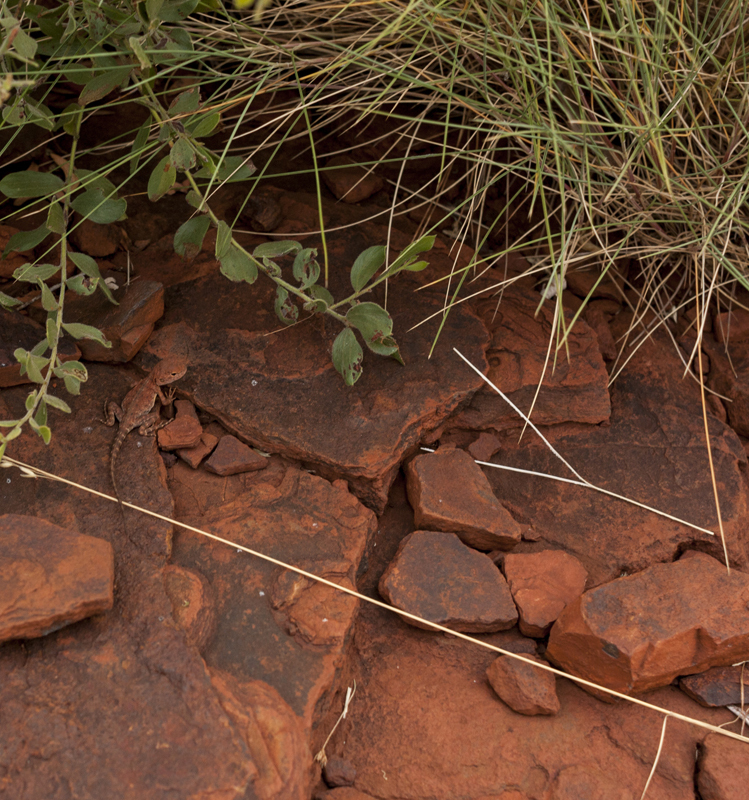 I’ll admit I’m finding it challenging photographing the large amount of beautiful red rock – I’ve never photographed this colour in a natural form before. Also down in the gorges the natural light can be limited at certain times throughout the day. These two challenges left me playing with camera settings for most of the trip. 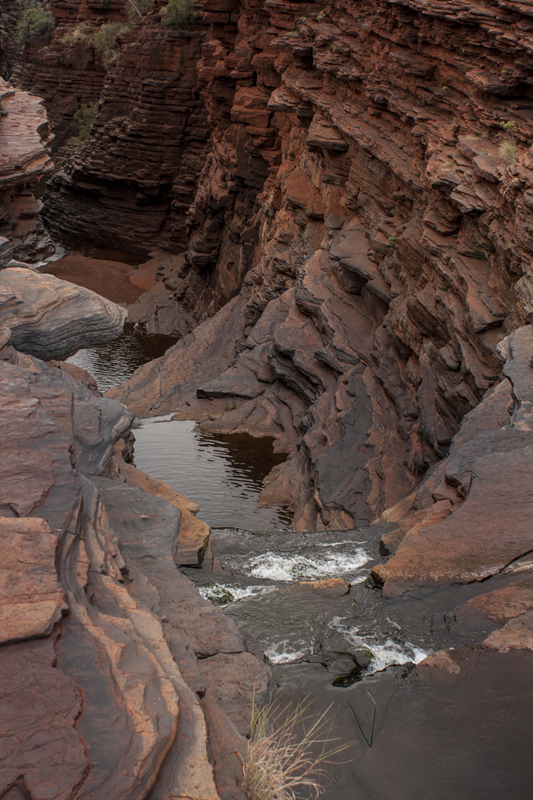 When I returned home I found this handy blog post on photographing Karijini by Rodney Campbell and will definitely be using it next time! The trail terrain is mayhem really, uneven rocks of varying structures and sizes from crumbling chunks to large tiles. Interestingly, the rocks have some decent weight to them. We become accustomed to trail walking at Karijini, rather quickly and similar to mountain biking, the experience does keep the mind alive and alert! 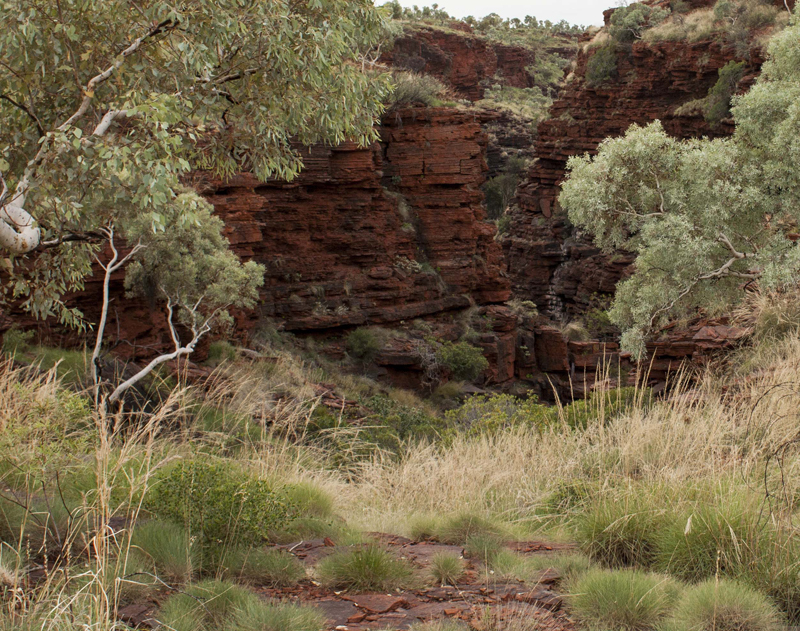 Experiencing the outback in this fashion does provide a sense of achievement when the day has ended and you’re kicking back under the stars with a camping meal and drink. With eyes periodically glancing down, I spot the tiniest gecko (I think it is?). I guess if the trail was straight and flat I probably wouldn’t have noticed such detail. 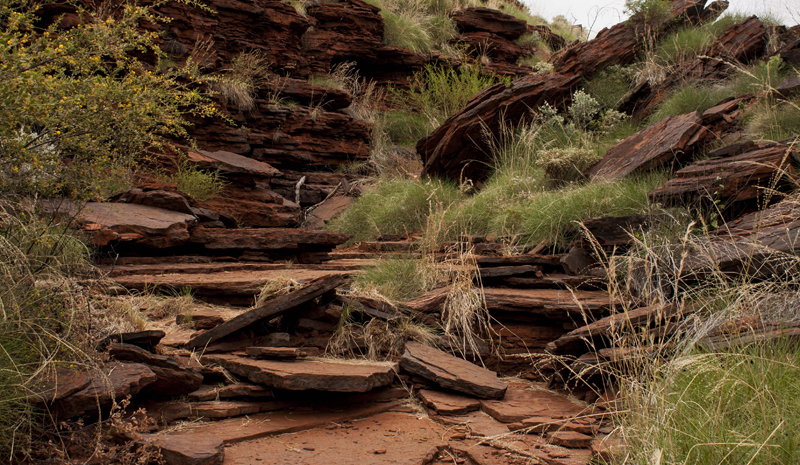 The trail weaves around collective rock structures while mildly descending towards the gorge. We make our way past streaming water on the natural and very convenient flat stepping stones. 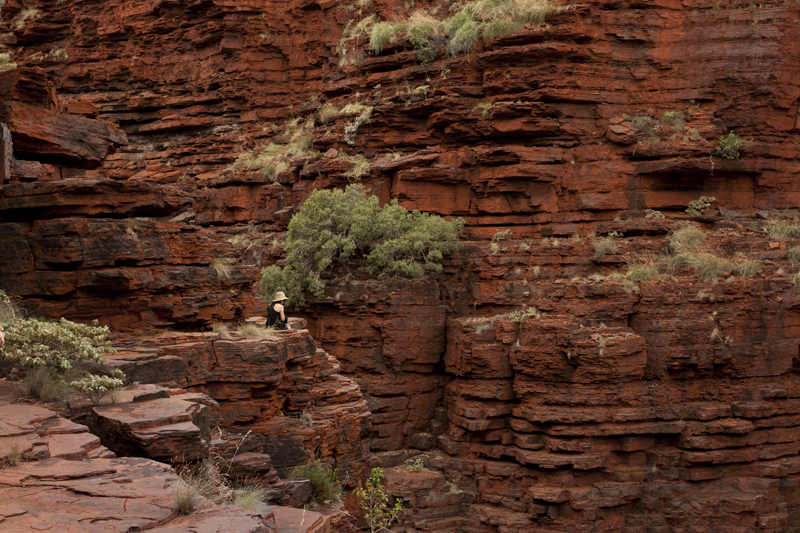 And since most of the shots at Karijini have Derek in them, here is one of me in walking motion. 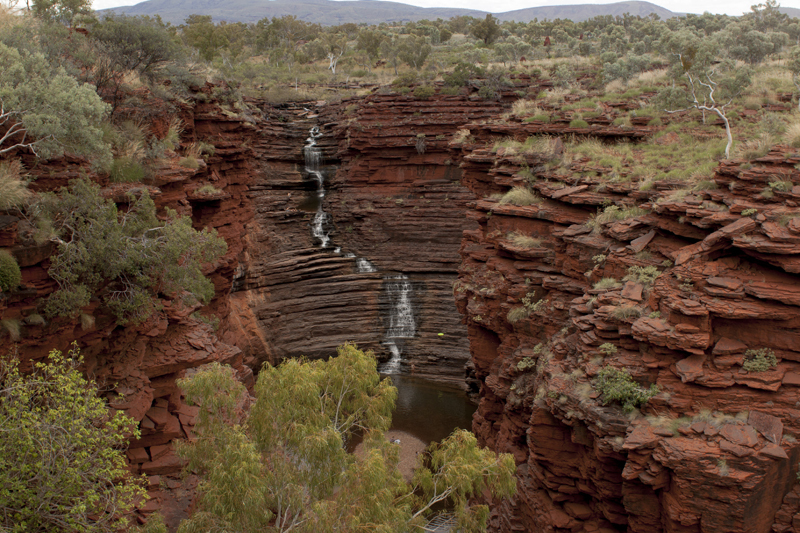 Immediately we establish the gorge is quite different to Dales, the walls are dominated by layers upon layers of smooth curved rock tiles with less vegetation. Could this be Planet Mars? 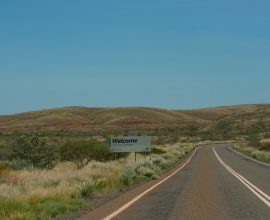 The scene looks foreign, yet this is every part of Western Australia. 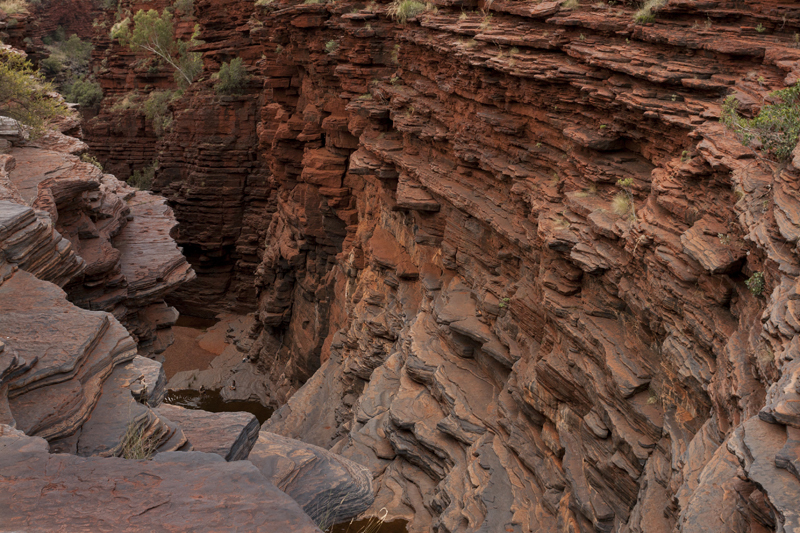 The walls of the gorge have been shaped by weather events such as flash flooding over the course of many years, making it significantly special. 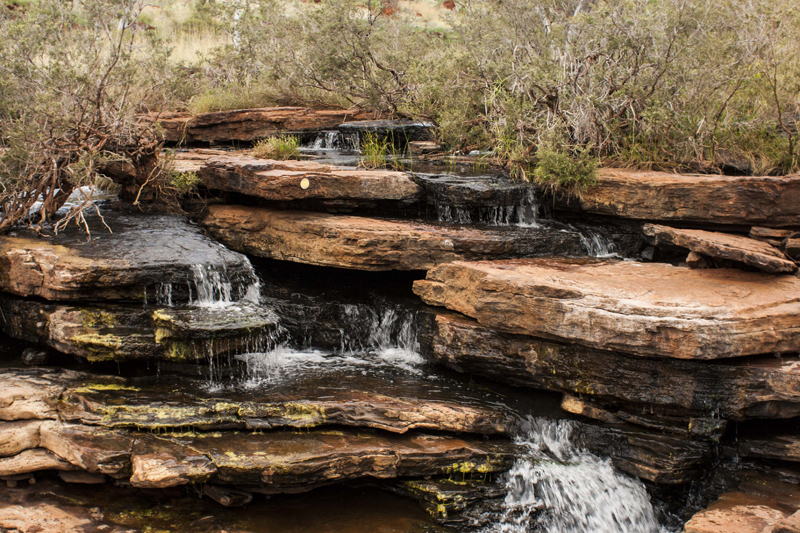 We pass by the top of the water fall to the sounds of water flowing and echoed voices below. We’re now on the other side of the rim and to visually demonstrate the scale of the landscape we are treading, can you see the three people in the photo below? Fig trees grow in the walls, their roots drape and cling to rock creating a dramatic effect that leads me to compare an Indiana Jones movie. At this point, every which way we’re treated to a number of views into the gorge. 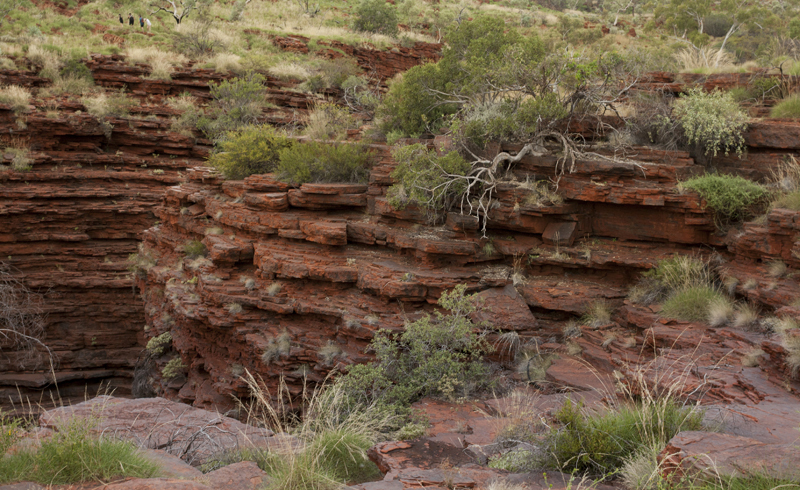 If it weren’t for the Easter holiday crowds and the close proximity to Eco Retreat, you could really take a moment of absolute peace, perched on a rock looking into the rusty red landscape. It’s not to be today for there is plenty of noise around. The trail is class 4 and so far the subtle descent has allowed us to take in and appreciate the surroundings. Around the corner from the below photo we’re about to embark on the class 5 section, 500 metres of a steep descent. The camera goes into the backpack. We’ll need both hands. 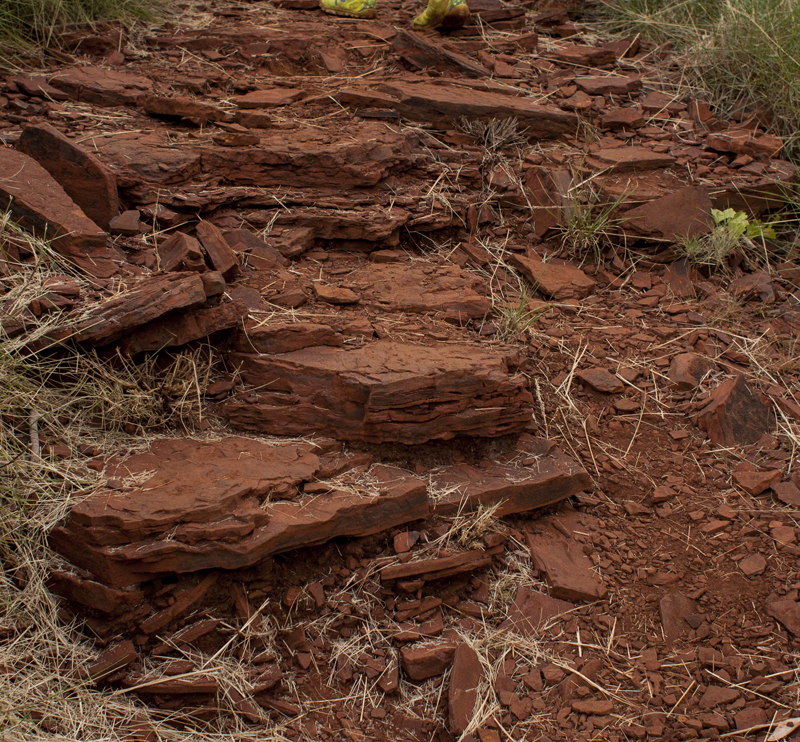 We scramble down in almost a zig zag fashion from one rock structure to the next. I bum slide myself down one slanting rock slab and hoist myself down the rock. Derek’s all over the obstacles and gives me a guiding hand. Before we know it, we’re in the gorge. I’m a little surprised to be in the gorge, from the lookout, the task appeared quite different and I anticipated the vertical descent would create a mental mind block for myself. 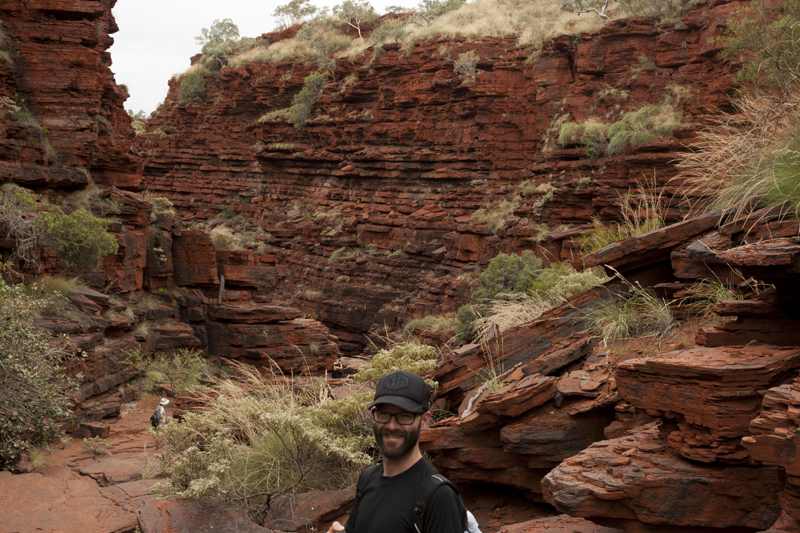 Having said that, hiking Mount Bruce the day before and spending a further day in Dales Gorge, perhaps I have developed good gorge descending techniques. 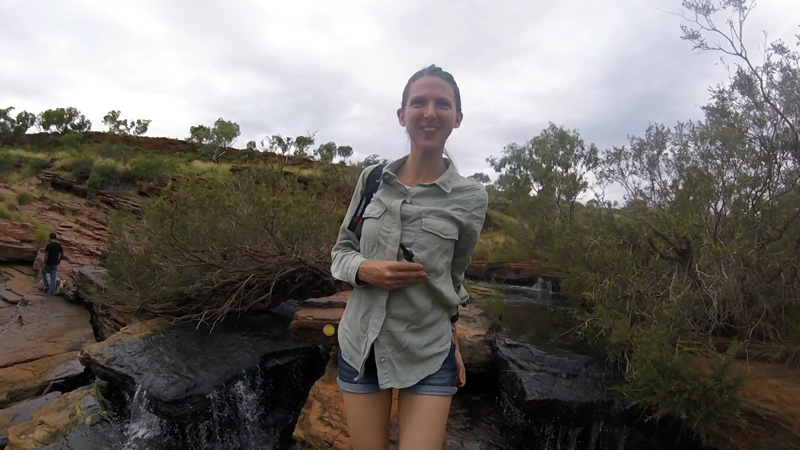 It’s quite cool on the bottom of the floor and as we take in the surroundings we’re all too aware of sunset approaching, so we decide to skip the first pool of water and head to the waterfall. We hug smooth rock whilst using a thin ledge to trace our way towards the waterfall, some people wade in the water instead. From the amount of people traversing the ledge during the day, its left quite wet. 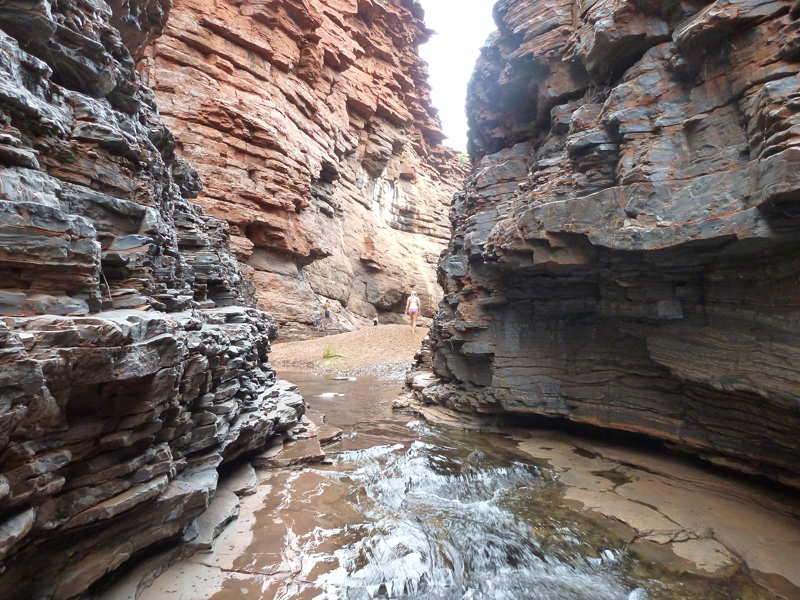 We come to a narrow passage with trickling water, I underestimate the crossing and slip, however recover myself mid fall and avoid hitting the hard rock floor. It’s easy to become a little excited and misjudge the terrain. Around the corner we step into a natural curved wall amphitheatre with the waterfall right in front of us. I notice people in this area are wearing reef shoes and it isn’t until I step up onto a small patch of dry ground that I realise why, we tread uncomfortably on pointy rocks and the moment we can swim the rest of the way, we do so. Be it the water is a tad cold. We hang around wading in the water, take a few pictures by the waterfall and constantly look up at the view. The feet feeling tender and skin covered in goosebumps, it’s time to call it a day. It must be dinner time because most of the people are heading back too. A group of travellers follow behind us and a lady slips off the low ledge into the shallow water, thankfully her backpack cushions the fall. With some cuts, her male companions seem more concerned about her ruined phone. We offer help but they don’t understand our English. With the drama behind us, in front of us is a family of five making their way up. We’re patiently waiting in a line, in the wilderness. The mother and daughter are snapping pictures and it begins to rain. The kid in crocs with a long towel draped over him flutters around carefree and I’m cringing at the thought of him slipping. The Dad realising he has some work mustering the family up, kindly lets us pass. We want to make a move before the class 5 section becomes slippery and wet from the rain. It is a swift scramble up, I need a helping hand from Derek to get up the rock slab I previously bum hoisted myself down on. Once over the climb, we take our time on the rest of the walk back. We spot the foreign travellers again, this time trying to take some risky selfie photos on the ledge near the waterfall – getting that killer shot I guess. While Joffre Gorge was absolutely stunning to see, on Easter Sunday it was a tad bit busy for our liking so we will definitely look at returning perhaps on the off season. 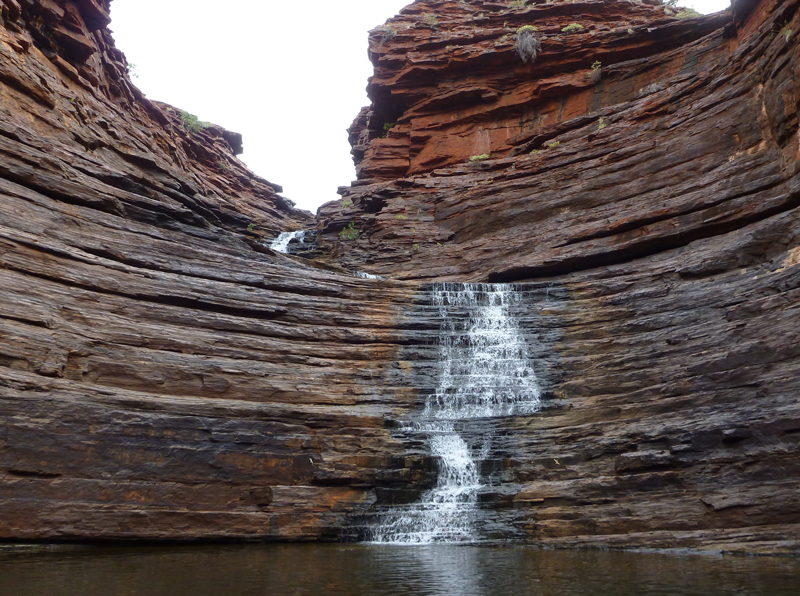 A combination of water, rocks and steep descents make this gorge a little trickier to traverse, however well worth the careful effort for the opportunity to walk the floor and swim in the cold pool. 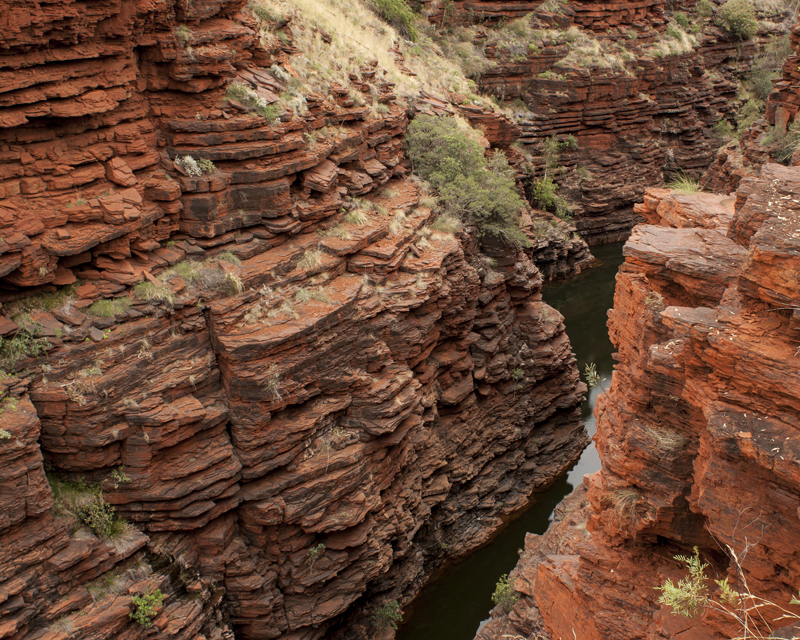 If you’re looking for a less difficult gorge walk in Karijini National Park, Dales Gorge is a better starting point. 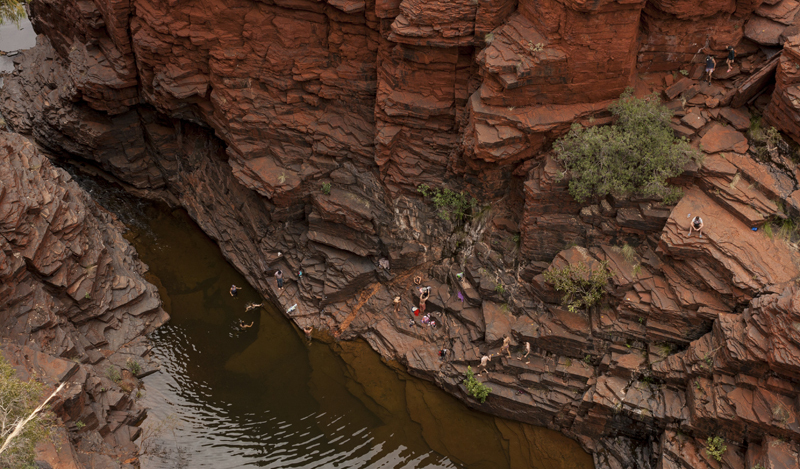 There are three spots to swim as well as a staircase down into the gorge.